1. Traditional carrot cake is loaded with things we cannot eat at our house due to food allergies (dairy, walnuts, nutmeg). 2. Once a cake is sitting there, lonely, I like to slice off just a bit. Then just a bit more. Then sometimes I have to even things up. With both of these things in mind, I decided to lighten it up a bit, make it food-friendly for our house, and make it in individual portions so that I would know EXACTLY how much I was choosing to consume. Plus, when you make things in individual portion sizes, the old “even things up” feeling goes away. Unless you have a thing about even or odd numbers, in which case you may have bigger fish to fry. To add a little boost of goodness to replace the traditional cream cheese frosting, I’ve added booze to the store-bought frosting. I like to think of that as the ultimate touch of class to top off these baby cakes. These little carrot cakes are packed with flavor, are low in calories, and pack a satisfying punch. 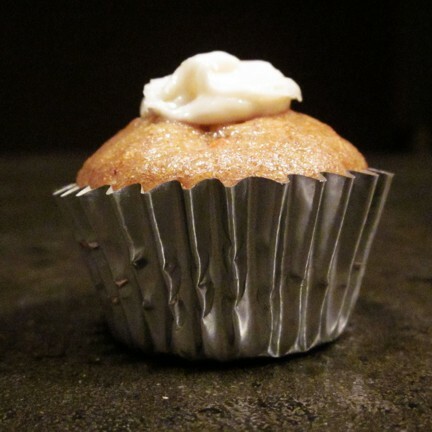 Using mini-cupcake liners, this makes a pretty good sized batch. They are easy to freeze (a little easier to do without the frosting), but also disappear quickly. The baby cakes are a nice 2-bite dessert, unless you’re my dad, in which case they are a one-bite gulp. Preheat oven to 350 degrees F. Fill mini cupcake pan with cupcake liners and spray with cooking spray. In a small bowl, mix together the frosting and 1 t. whiskey until well combined. Set aside and try not to eat it. In another small container, mix together the soy milk and cider vinegar and set aside to curdle. You won’t want to drink this, so don’t worry about it. In a large bowl, mix together brown sugar, sugar, applesauce, egg whites, 1 T. whiskey, cinnamon and ginger. When well mixed, add flour, wheat flour, baking powder, baking soda, and salt. When it is all well mixed, add carrots and combine. Add about 1 T. carrrot cake mixture to each cupcake liner so that it is filled about 3/4 way to the top. Bake for 11-12 minutes, remove from pan and set aside on a rack to cool. When totally cooled, add a little dollop (about a 1/4-1/2 t.) of frosting to the top of each. – You can substitute any of the non-dairy ingredients for their dairy counterparts. – Don’t have Jack Daniels? Any bourbon or whiskey will do. – Don’t want to use booze? Try some vanilla, adjust amounts as needed. – When looking for a non-dairy can of frosting, I have the best success with store brands. If non-dairy is important to you, just check the labels to be sure the store-bought frosting you select is non-dairy. This sounds really really awesome! What if I want to make them without the carrots? I mean, only if I were intensely selfish and cruel since my household adores carrot cake. But really. what would happen then? I think that if you omit carrots, you ought to skip everything but the whiskey, then add some ice, top with ginger ale, and change your name to Babycakes.